If only people would get together with their worst enemies for a hot beverage, the world might be a more friendly place, says a new ad from a U.K. tea brand. 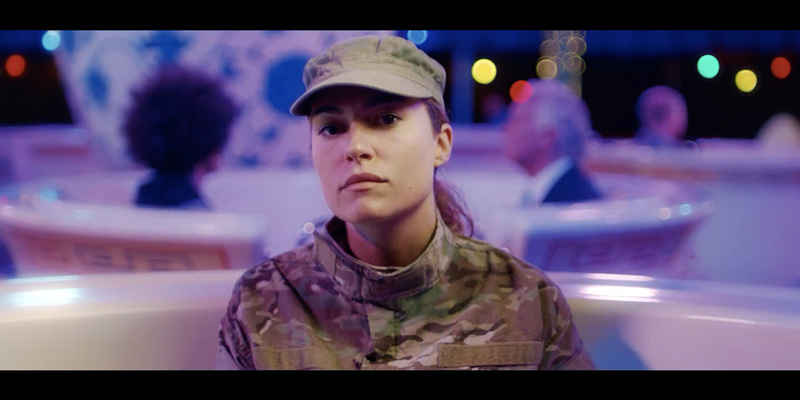 Brooke Bond, owned by Unilever, is celebrating World Peace Day with a minute-long spot created by LOLA MullenLowe, that shows individuals seated opposite their ostensible political nemeses in a classic spinning Teacups carnival ride. There’s a North Korean soldier paired with a U.S. servicewoman. A orthodox Jewish man and a Palestinian man size each other up. An Indian man and a Pakistani man do the same. But as everybody spins around on the carousel, and a childlike piano melody plays in the background, glowers turn to smiles and even laughter—despite being steeped in decades of ethnic, religious or ideological conflict. “We should all share a cup of tea sometime,” reads the tagline, the only copy in the ad. It’s beautifully shot, and a moving sentiment—a nice reminder that humans tend to have more fundamentally in common than not, and are generally capable of sharing the same kind of simple joy (at least, in an optimistic view). It’s also not the sort of thing that should be examined too closely—a message that, given the real complexity of the situations at hand, can start to look fairly infantile under a small amount of scrutiny. That tension, and the overall concept, are distinctly reminiscent of Coca-Cola’s soda diplomacy, wherein it connected Indians and Pakistanis through a pair of interactive and interconnected vending machines that let them give each other cold beverages by touching hands and dancing with each other, despite geographical, cultural and political boundaries—to heartwarming effect. Then there’s the fact that the ad appears to include only one woman, and no black people—curious choices given the tone of global togetherness it seems to be promoting, and the prevalence of racial and sexual strife and subjugation throughout the world, both historically and in current affairs (perhaps too complex for the conglomerate to tackle in this one short spot, which seems to rely mainly on modern conflicts easily recognizable to a Western audience—though the somewhat more opaque juxtaposition of a young skinhead and a middle-aged bald white man in a red jacket suggests perhaps a missed opportunity for a more rounded argument). To be fair, Brooke Bond could spend its advertising dollars on a less positive message. The world certainly needs more upbeat and kind voices to drown out the vitriolic ones, and there’s a solid kernel of insight in the parable. But it also knacks of the sort of opportunistic pop-marketing platitude that makes you wonder if advertising’s real purpose is to soothe you into a state of soft-brained complacency. It’s all good and well if you smile at your neighbor, and lament the sorry state of international affairs, and fantasize about better days head. But just make sure you keep filling up your shopping cart.